John Challis in an April 24 photo following a baseball game with his Freedom High School team. Mr. Challis died Tuesday after a battle with liver and lung cancer. As John Challis battled terminal cancer this spring, he had some goals. He wanted to graduate from Freedom High School in Beaver County. Check. That happened in June. He wanted to take one last cruise with his family. Check. That happened in mid-June. He wanted to start a foundation to raise money for other teenagers with cancer. Check. That got off the ground in July. But what John wanted most was to touch people through his actions and words. Check. That happened countless times. 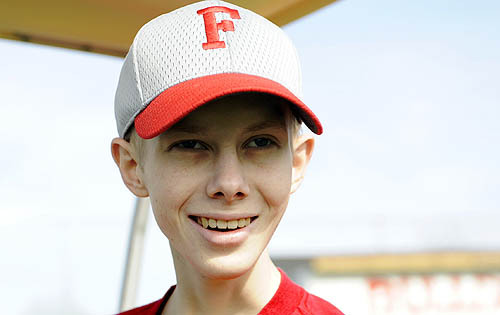 John Challis, a teenager who became nationally known the past few months, died of liver and lung cancer Tuesday afternoon at his family's home in Freedom Township. He was only 18, but he passed away with a sense of accomplishment. In late June, John did an interview from his home. Weak from the cancer that had spread throughout his body, John struggled to keep his eyes open. But his message was strong. "Everybody is scared. It's not normal to not be scared," John said of his plight. "But I'm not scared as much now. I have letters and other things from people, telling me how I've helped so many people in numerous ways. That makes me feel good." John had been battling cancer for more than two years, but his hit in a Freedom baseball game this spring led to a story about John in the Post-Gazette, which led to national attention. People were inspired by John's story and his words. His family has two boxes of letters and cards from well-wishers and people who wrote to let him know they were inspired by his story. His family also has two binders filled with hundreds of e-mails from people who said John had impacted their lives. One of the e-mails came from a man who said he gave John's Post-Gazette story to a friend -- and it helped turn him away from suicide. "I just want to say thanks to the people for keeping me going," John said. "All them little cards and stuff I got, keeps me going day by day. To know I'm going downhill a little bit, it doesn't bother me because I've helped so many people. Since I've helped so many people, this is easier to handle." "Courage + believe = life" became John's trademark. He wrote it inside his baseball hat and some of his Freedom teammates did the same. A baseball glove company sent John a black glove with "Courage + believe = life" embossed in the leather along with John's name. "Life ain't about how many breaths you take. It's what you do with those breaths," was another one of John's memorable quotes. One of John's most remarkable moments came in April. He had always loved sports, but because of the cancer, he couldn't participate as a junior or senior at Freedom, except for a few plays in the final football game of Freedom's 2007 season. John became friends with Freedom baseball coach Steve Wetzel and Mr. Wetzel asked John to be part of the team. He hadn't played baseball in a few years, but John wanted a chance to hit one last time, and Mr. Wetzel granted the wish, pinch-hitting John in a game against Aliquippa. It couldn't have been scripted any better. John lined a run-scoring single to right field -- on the first pitch. Although he had trouble running, John made it to first base, yelling "I did it. I did it." That hit helped John's story take off. Over the next few months, John watched a Penguins playoff game with Mario Lemieux, was featured on ESPN television, addressed the Pirates before a game and spent an afternoon with Alex Rodriguez at the New York Yankee's penthouse in Manhattan. He was interviewed on national radio stations and on some stations in other cities. ESPN did a story on him for its SportsCenter show. A teenager from a small Western Pennsylvania town, dying of cancer, had become a national celebrity. "We would get things [in the mail] almost every day from people all over the country," said Scott Challis, John's father. When John attended a Yankees game a few weeks ago, he had a press conference, surrounded by more than 20 reporters and photographers. "People would sometimes call, too, just wanting to talk to him," his father said. "Some wanted to come meet him. It was amazing. I guess he touched so many people. We were in the airport at Newark [N.J.] and people were coming up to him because they recognized him." The Pirates brought John to a game in June, gave him a uniform and let him address the team in the clubhouse. He told the players to not worry so much about their statistics and have fun. Mr. Wetzel listened as John told the Pirates to cherish the game -- and life. "Some of the Pirates got emotional." Adam LaRoche took particular interest in John and stayed in touch with him after his visit. Recently, LaRoche called John an hour before a Pirates game, just to see how he was doing. John also spent some time with the Tampa Bay Rays when the team was in town to play the Pirates. "Their manager, Joe Maddon, called and said he saw the story on John on ESPN and he was just in his hotel room in tears," Mr. Wetzel said. "He said he just wanted to meet John." But John's favorite moment in the past few months was the trip to New York for a Yankees game. "Just because it was with my dad," John said. "It was a good time because we both got to experience it, and it felt like something not just for me, but something he enjoyed as well." John faced his death with courage, dignity, a never-quit attitude and an awareness that was hard to fathom. John's mother, Gina, tells the story of how a nurse started coming to the family home in June. Gina Challis said, "The first time she was here, John said, 'I know why you're here. You're here to make me comfortable in my last weeks. But it could be more than a few weeks, right?'" Mr. Wetzel became extremely close with John over the past few years and had asked John to be in his September wedding. "I really can't explain how his story took off, but the kid was just unbelievable," Mr. Wetzel said. "His attitude and messages I think changed how some people looked at their lives. He changed how I went about life. "I feel like a piece of my heart is gone now. The thing I'll miss most is his smile. He had a smile that could light up a room." When asked a few weeks ago how he would like to be remembered, John said, "I could see people having some beers and hopefully remembering how I always tried my best, no matter what I was doing. That's my message just for people to always do their best, no matter what they're doing or how stupid it might seem. And no matter what, there will always be a reward, no matter how small it is." The web site for John's foundation is www.courageforlifefoundation.org. Donations can be made through the web site. Besides his mother and father, John is survived by a younger sister, Lexie. Information on funeral arrangements was not yet available.